KE00052 is a solid phase sandwich Enzyme Linked-Immuno-Sorbent Assay (Sandwich ELISA). 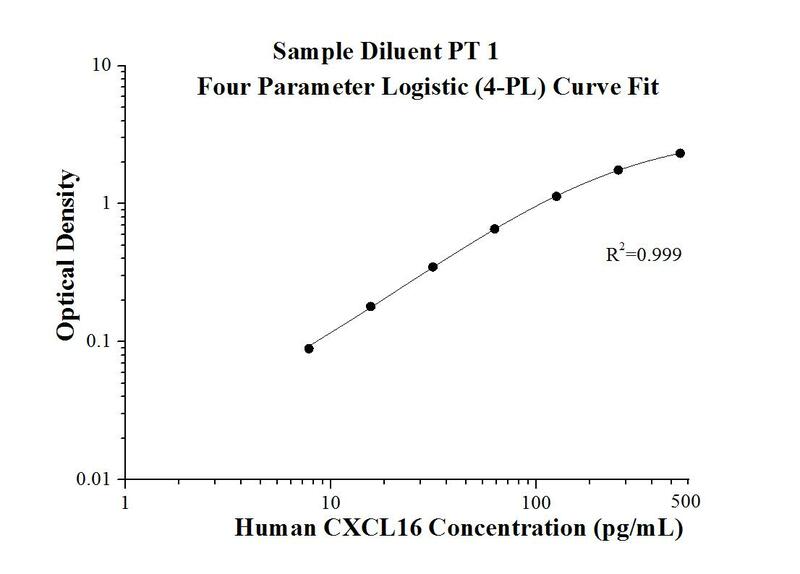 The CXCL16 ELISA kit is to be used to detect and quantify protein levels of endogenous CXCL16. The assay recognizes human CXCL16. A polyclonal antibody specific for CXCL16 has been pre-coated onto the microwells. The CXCL16 protein in samples is captured by the coated antibody after incubation. Following extensive washing, a polyclonal antibody of biotinylated specific for CXCL16 is added to detect the captured CXCL16 protein. For signal development, Streptavidin-HRP is added, followed by Tetramethyl-benzidine (TMB) reagent. Solution containing sulfuric acid is used to stop color development and the color intensity which is proportional to the quantity of bound protein is measurable at 450nm with the correction wavelength set at 630 nm. CXCL16 is a recently discovered cytokine belonging to the CXC chemokine family, which is synthesised in plasmacytoid dendritic cell as a transmembrane molecule. It exists in a transmembrane and soluble form. The transmembrane form of CXCL16 functions as an adhesion molecule for CXCR6-expressing cells, whereas the soluble form of CXCL16 mediates infiltration of circulating cells into sites of injury. CXCL16, has been proposed as an important pathogenic mediator in inflammatory diseases, including rheumatoid arthritis, glomerulonephritis, or prostate cancer. CXCL16 has been implicated in some forms of renal disease such as lupus nephritis and antiglomerular basement membrane nephritis. CXCL16 also plays a pivotal role in the pathogenesis of angiotensin II–induced renal injury and fibrosis through regulation of macrophage and T cell infiltration and bone marrow–derived fibroblast accumulation. Low-Dose Acetylsalicylic Acid Treatment Modulates the Production of Cytokines and Improves Trophoblast Function in an in Vitro Model of Early-Onset Preeclampsia.